By law, anyone carrying out work on gas installations and appliances in your home must be on the Gas Safe Register. Be gas safe always use a Gas Safe registered engineer. Always ask to see their Gas Safe Register ID card. The Gas Safe Register exists to protect you, your family, and your property from dangerous gas work. Incorrectly fitted, badly repaired or poorly maintained gas appliances are a major cause of lethal carbon monoxide (CO) poisoning, and can also lead to gas leaks and explosions. To carry out work on gas installations and appliances safely and legally, engineers in Great Britain and the Isle of Man must be on the Gas Safe Register. They make sure the 120,000 plus engineers on the register are safe by inspecting the gas work they have carried out. The Gas Safe Register is the official gas registration body for Great Britain (GB) and Isle of Man, appointed by the Health and Safety Executive (HSE) for Great Britain and HSWI for Isle of Man..
Gas Safe Register replaced CORGI as the gas registration body in GB on 1 April 2009. The HSE carried out a review of gas safety in 2006 which, after consultation with the gas industry, engineers and the public, led to the decision to change to a new gas registration scheme. The contract to run the new scheme was awarded to Capita and we launched Gas Safe Register. The sole focus of the register is on improving gas safety. What gas work needs to be done by a registered engineer? 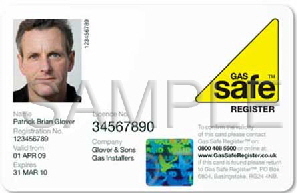 Not all gas engineers are qualified to do all types of gas work so you should check what type of work your gas engineer is qualified to do at the Gas Safe Register and confirm this by checking the rear of his ID card. 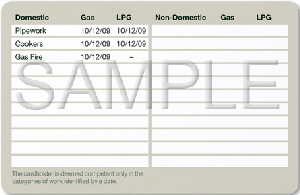 See the sample card below.